The Bosch RA1181 is a popular and reliable router table used by professionals every day in their routing tasks. If you are looking for a router table and unsure which model to get, then you have come to the right place. We reviewed this iconic router table in a detailed and logical manner so as to see if this product will make a nice addition to your workshop or not. Additionally, later on in our review we also have an interesting comparison between two heavyweights of the router table industry - The Bosch RA1181 vs the older Bosch RA1171. 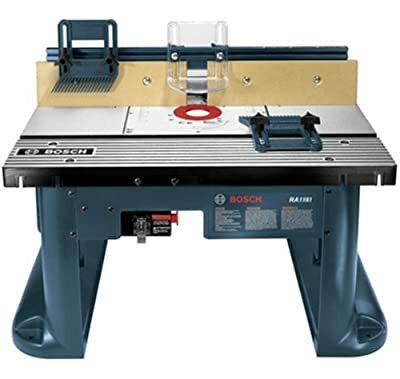 The Bosch RA1181 is a benchtop router table while the Bosch RA1171 is a cabinet router table. Other than these 2 clear physical differences, they perform the same task of providing support to a wood router along with having a few differences here and there in terms of dimensions. The Bosch RA1181 is the most popular and more expensive model out of the two and considered an upgrade to the older but cheaper Bosch RA1171. How exactly do they stack up together and is buying the cheaper Bosch RA1171 worth it? Let's find out! Here are some of the most important features of the Bosch RA1181. The benchtop of this Bosch router table measures a very generous 27 x 18 inches. The 18 inches depth is large enough to work comfortably with wide materials such as wood planks and even sheets. It has a machined aluminum surface which means that it is very durable and offers little resistance on your material. Stock will easily glide over the surface giving you more maneuverability, comfort, and accuracy when routing. Additionally, it is very flat with no uneven surfaces. We like how this benchtop is solid with no vibrations when the router is operational, giving you more comfort and added accuracy. One of the best features of the Bosch RA1181 is that it is compatible with every wood router on the market. It comes with special fittings and industry standard predrilled mounting inserts for attaching your branded wood router. The base plate is made from aluminum which means that it can withstand wear and tear quite easily and is very durable, as you would expect from aluminum. The T-slots allows you to quickly and easily attach accessories like a miter gauge to this router table. Additionally, Bosch delivers this unit with a pair of featherboards for more accuracy out of the box. It does not come with a miter gauge but this is not very hard to find in any hardware store for dirt cheap. You might even already have one lying around in the workshop. Even the 4-7/8 x 25-1/8 inches fence is made from aluminum for greater durability and maneuverability. It is also long enough to work comfortably with long pieces of stock like wood planks. It has a maximum opening of 3-5/8 inches which is very beneficial when working with materials that generate a lot of sawdust. In tandem with your dust collection system, it will drastically help keep your routing clean. The base of the table is possibly one of the most important factors in a router table. With an unstable base, routing is far from being accurate. Luckily, the large table base provides a lot of stability to the router table in general. And talking about stability, it even has mounting inserts so that you can easily screw or bolt this router table to the ground for even more stability. As expected, this router table comes with 2-1/2 inches standard dust port hose that allows you to connect your external dust collection system quickly and easily. The large fence opening of 3-5/8 inches along with 2-1/2 inches dust port means that a lot of air can be sucked in very quickly helping keep your benchtop clean at all times. In fact, you will not notice debris while routing because the air circulation is just that effective in this model. Dual outlet switch: this is a feature we never expected to find but very happy to find it included in this relatively affordable model. What this does it provide more options on how you want to connect this router table to your power outlet and router, as well as having a 15-Amp overload protection circuitry. Lock: The keyed lock at the front provides a secure way for you to lock down your router table and prevent unauthorized use. When the lock is engaged, the fence and base plate cannot be moved or removed. Featherboard: You get a pair of featherboards to hold your material down. Adjustable clear guard makes it safer to route while not sacrificing visibility. The price is the true star of the show when it comes to the Bosch RA1181. We have to say, for such a big device filled with premium-grade features, we absolutely love its price point! It is offered at an extremely competitive price that makes it unbeatable in its price range. The closest rival we can think of that offers almost the same build construction, accuracy and versatility is its bigger brother - the Bosch RA1171. It stays in the family, it seems. There is no contest, this router table is one of the best value for money tools out there. Especially when you think about the fact that router tables are normally very durable and long-term tools that can last decades without the need of a replacement. Furthermore, even the parts are replaceable which makes the need for buying a new router table even more redundant. Since this is a very stable and versatile router table, many professionals in the trade use it every day in the day to day routing tasks. Here is what a few woodworking experts have to see about the Bosch RA1181 benchtop router table. Jack Plating from ProToolReviews.com made a very good detailed review of this model. He is a professional carpenter and avid craftsman who definitely knows about his stuff. Jack gives you his first impressions about the overall features as well as the built construction of this model. In essence, he likes what he sees. He also posted many pictures of him giving this product a spin. Additionally, he found the router table to be sturdy and produced accurate results. Adjustments are also very easy to make and he had no problem using this device out of the box. Every feature advertised worked flawlessly according to him. As expected, he ends up highly recommending this product and gives it a solid star rating. He calls it a “great all around router table”, to which we have to agree as well. The value, feature set and build quality of this product get a very high rating on his review site. NewWoodWorker.com is a popular destination for those interested in woodworking. Wood expert Tom Hintz made a lengthy and yet informative review about this Bosch router table. Just like Jack Plating above, he goes into details about the various features of this router table including the large table, the aluminum router plate and the other highlight features in this model. He used the Bosch 1619EVS wood router with this router table and concluded that it is a very stable product. The Bosch 1619EVS is a very powerful wood router that few router tables can handle without any vibrations. His only complaint is that it is a little bit difficult to adjust the router bit height using this table, but this has most likely to do with the model of router he used rather than the router table itself. Overall, he describes the Bosch RA1181 as a very "capable and well-built router table" that brings a lot of versatility and capability to the workshop. He also talks about the very affordable pricing, which of course everyone will appreciate. Affordable price and value for money. Solid and quality built construction. Benchtop is made from aluminum and material glides over it very easily. Excellent maneuverability. Aluminum baseplate compatible with 100% wood routers on the market. Router adapters included for mounting on the router table. Long fence equally made from aluminum and very easy to maneuver. Deliver a very accurate result and can be locked into position with T-knobs. Large and stable base for more stability. The base also has inserts for bolting to the floor for even greater stability. Little to no vibrations on this unit. Dust port compatible with all external dust collection systems. Large fence opening and 2-1/2 inches dust port keep your table clean from debris and sawdust. 15 Amps overload protection circuitry. Router table can be locked with a key and prevent unauthorized use. Delivered with featureboard for a better routing experience. If you are on a tight budget and looking for a high-quality and affordable router table that does not sacrifice features for price - then the Bosch RA1181 fits this criterion perfectly well. It is solidly built from aluminum and very stable when routing. Even when used with the most powerful wood routers out there. The performance is the best you can get at this price point. You will often forget that this is actually a budget router table and not a professional one that costs many times more than what this model is offered at. Our advice, if it fits your budget, get it! Compared to the Bosch RA1181, the Bosch RA1171 is a small cabinet style table. It has many similar features as the RA1181 with some minor differences. The benchtop of the Bosch RA1171 cabinet router table measures 25-1/2 x 15-7/8 inches which is around 3 inches less deep than the RA1181. They have the same 15-Amp amperage and overload protection circuitry, as well as a dual output port. One very small difference is also found in the maximum fence opening. The Bosch RA1171 has a maximum of 3-3/16 inches compared to 3-5/8 inches for the RA1181. This is a very small difference that’s almost negligible. The RA1171 is also a little bit heavier at 35 lbs compared to 30 lbs for its counterpart. Unless you are planning to carry your router table around, we do not see how this weight difference can translate to an actual benefit as most of the time they are sitting on the ground. One main advantage of the Bosch RA1171 cabinet router table is that it provides a space for you to discreetly hold your tools and accessories away from sight. 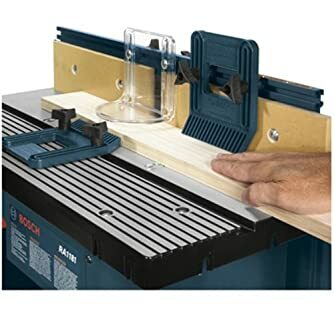 This is one of the main advantages of the cabinet style over a benchtop router table. There is also a different paint job on the Bosch RA1171. Being an all-gray color while the Bosch RA1181 is more flamboyant with a teal coloration. Other than this, the offer the same features with a slightly different pricing – the RA1171 is a little bit cheaper. In our opinion, there is no reason to go for the older and smaller Bosch RA1171. After all, the Bosch RA1181 is an upgrade and supposedly a replacement of the older RA1171 cabinet style. However, if the cabinet is important to you, then go ahead and get to the smaller Bosch RA1171. You will lose around 9” on the benchtop length and a few inches in width. If you do not need those big dimensions and route mostly on small DIY materials, then the Bosch RA1171 makes sense and will allow you to save some money right there. If not, the Bosch RA1181 is the superior product.